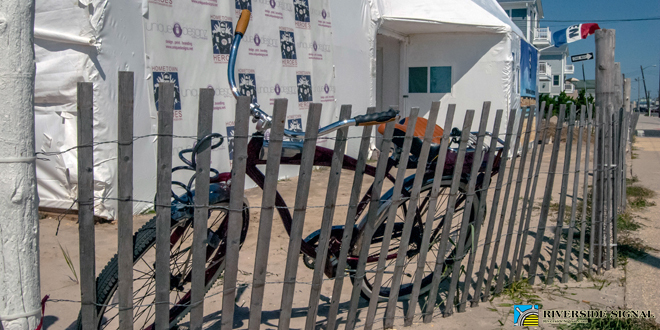 A bicycle rests along dune fencing outside Ed Jarrett’s Boardwalk Journey sand museum on North Ocean Avenue in Seaside Park. 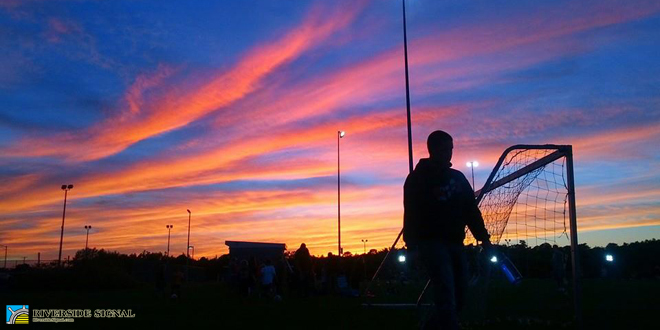 Just after sunset on the edge of autumn, Shelter Cove sports fields, Toms River. 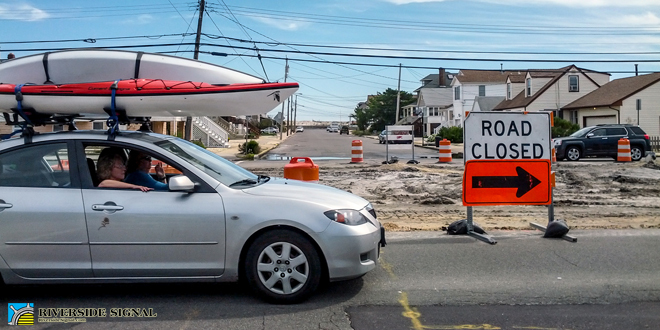 Work restarted on the Route 35/Central Avenue reconstruction project, seen here in the Seaside Park section of the barrier island, just after Labor Day. 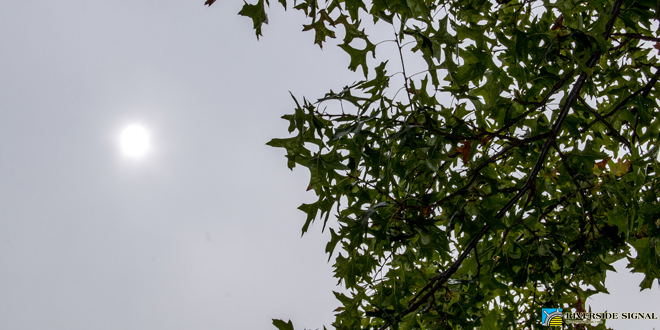 Starting October 13th, a new traffic pattern will redirect both lanes of traffic onto the northbound roadway to allow for milling and paving of the southbound side. 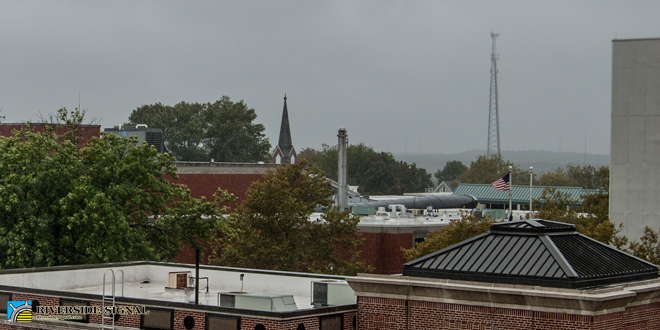 Looking through downtown Toms River toward the Forked River Mountains from the Ocean County Parking Garage on a grey day. 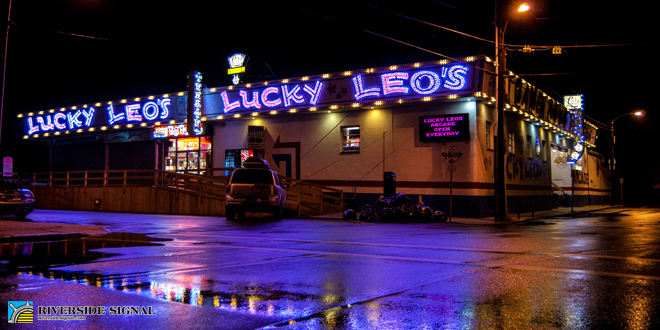 The exterior of Lucky Leo’s Arcade, Seaside Heights, shining in all its electric glory. 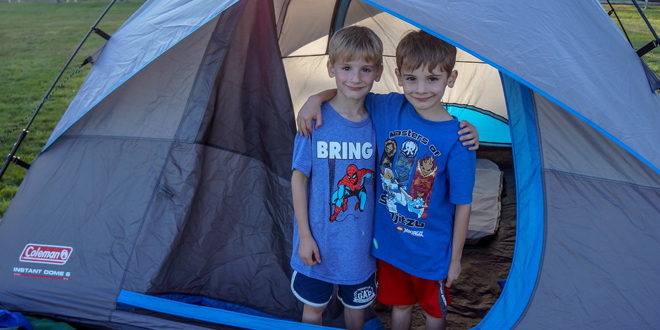 The annual Island Heights family campout, run by the recreation committee here, is a regular success. 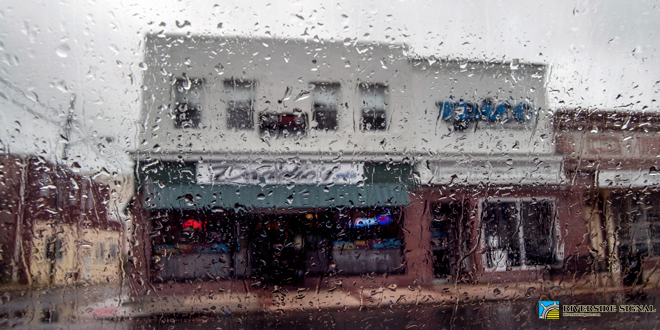 Rain-soaked businesses downtown on Washington Street. 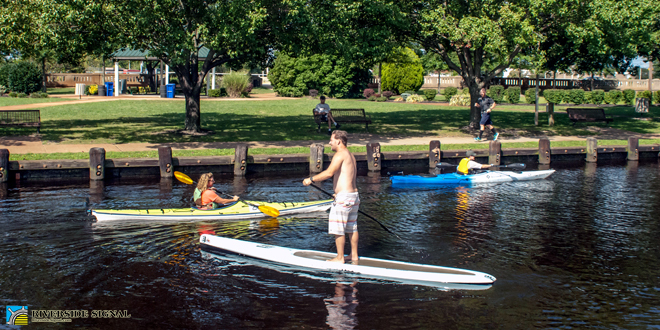 Paddleboard and other watersport races along the Huddy Park canal downtown. 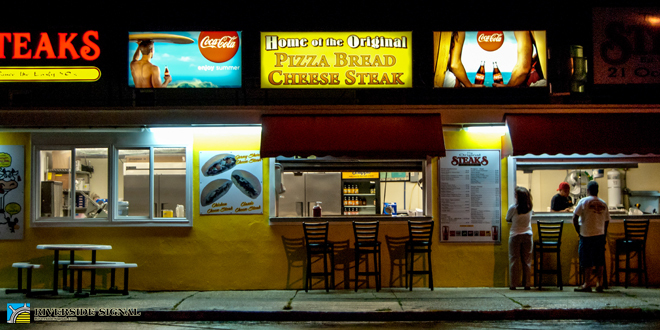 A local couple grab a late-night snack at The Original Steaks following a rainstorm in Seaside Heights. Opa! 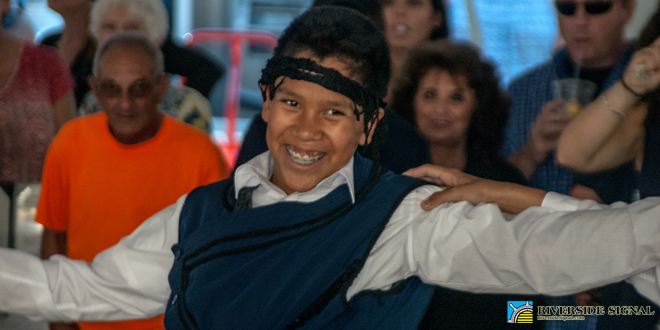 One of the dancers during Greek Festival, the 40th annual for the St. Barbara Greek Orthodox Church in Toms River. 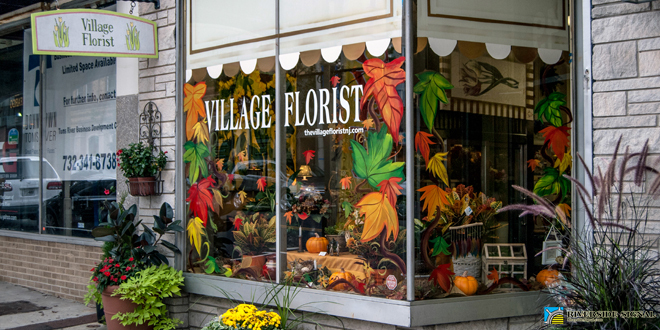 The Village Florist, Main Street, recently had its window painted and decorated for the new fall season. 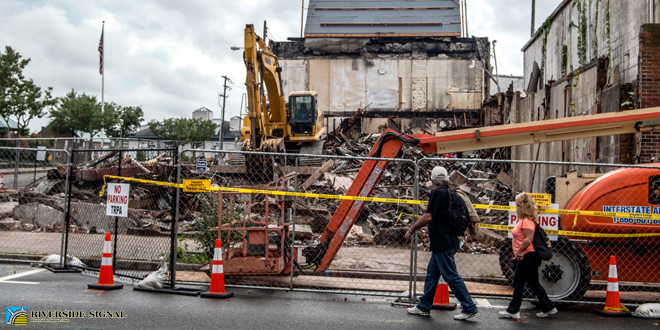 Two passersby take in the shattered crater where the McClenahan Building once stood on the corner of Washington and Robbins streets. 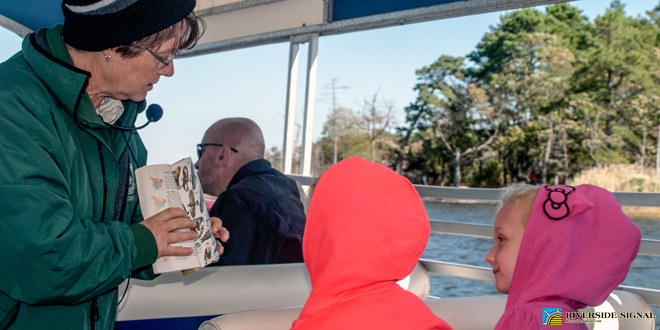 Siblings learn about ospreys during the second-to-last boat tour of the season off Cattus Island Park during the annual nature festival. 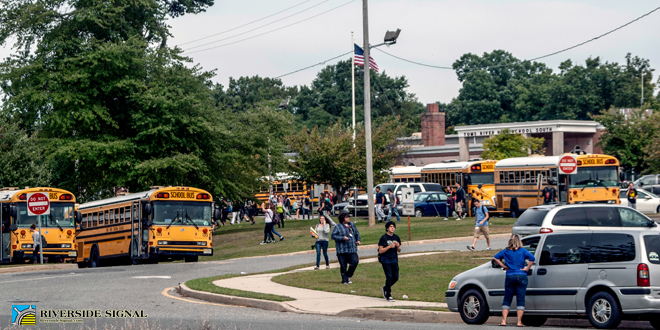 Toms River High School South, September 29th, 2014. 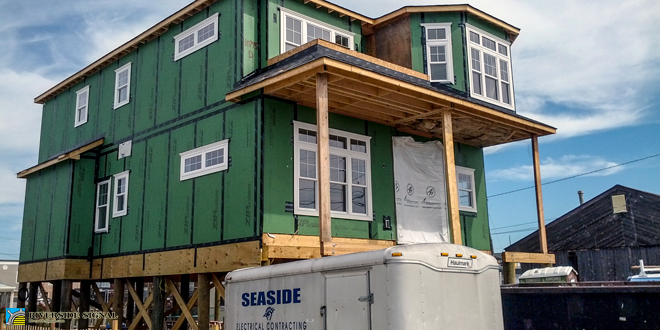 A new home under construction on 10th Avenue in Seaside Park. 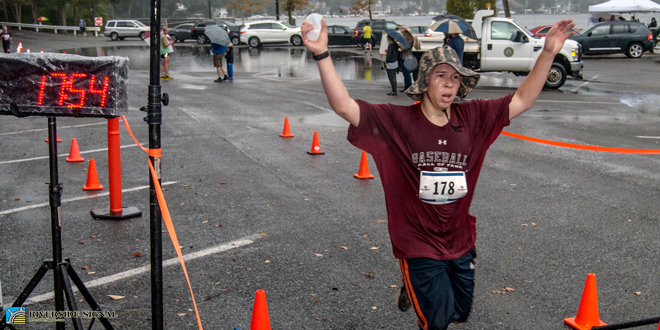 A fun but rainy Beachwood 5K. 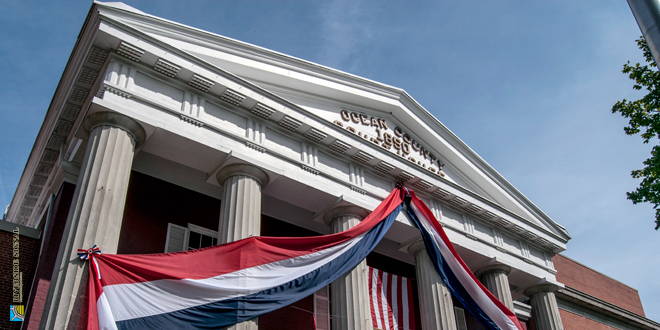 Patriotic bunting once again adorns our county courthouse, which can only mean one thing: a 150th anniversary commemoration ceremony of the Civil War in 1864. 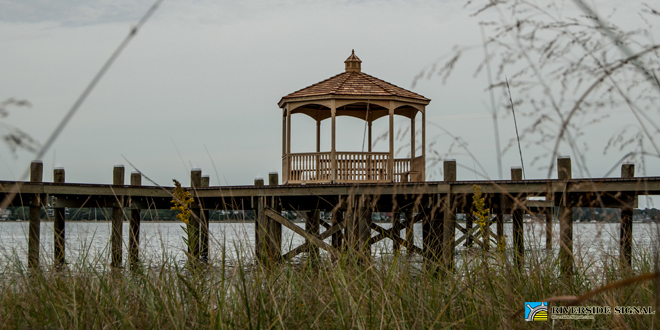 Construction continues at the Pine Beach riverfront and its new pier and gazebo where the Admiral Farragut Academy docks once stood. 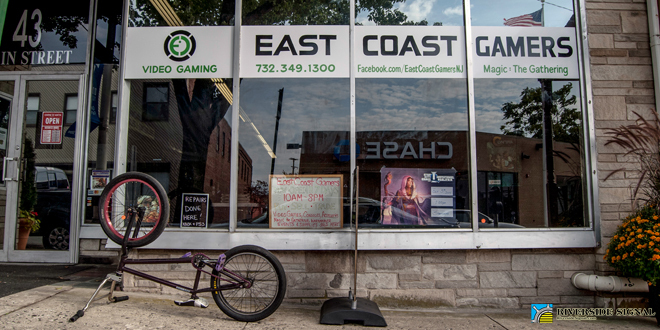 A youth’s bike overturned outside East Coast Gamers, downtown’s phoenix rising of shops for surviving the fire that took out their building on Robbins Street to come back better, bigger and stronger with large lines of stock in videogames, tabletop card games and more! 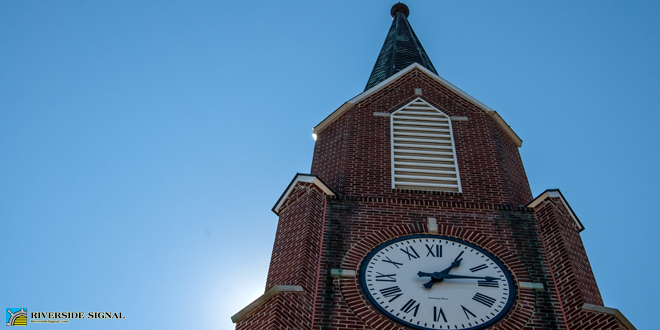 Now located at 43 Main Street. 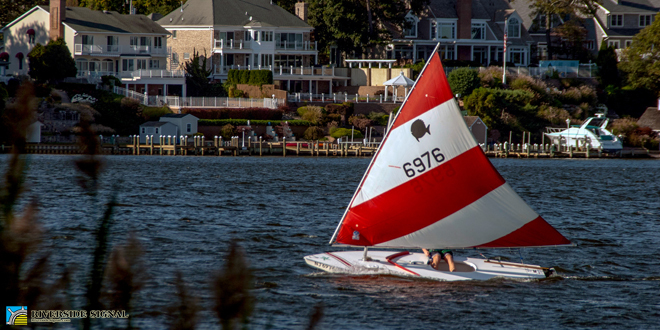 A sunfish with a candy cane sail skirts along the wind over the Toms River off Pine Beach. Taken from the new pier there. 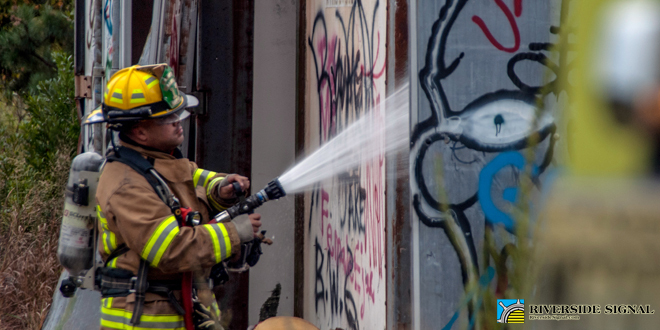 Extinguishing a fire set at abandoned trailers in Johnson’s Pit, Berkeley Township. 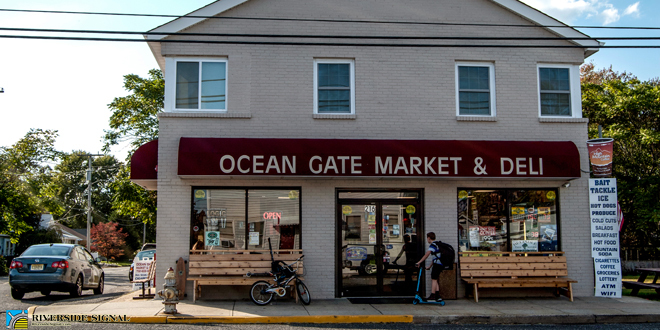 The recently restored and reopened Ocean Gate Market on a lazy fall weekday afternoon. 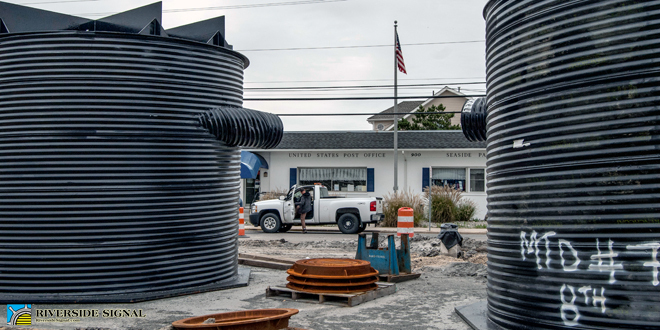 The Seaside Park Post Office, dwarfed by two large stormwater basins waiting to be installed beneath the center of Central Avenue/Route 35. 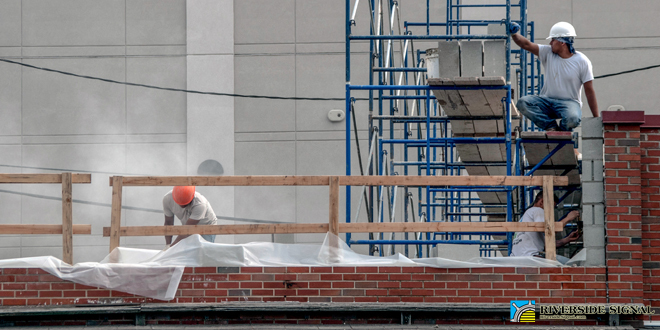 Workmen construct a second story onto the Purpuri Shoes building downtown on Main Street. 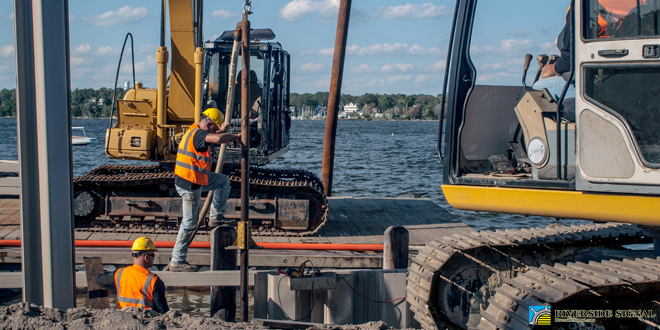 Workers from Extreme Marine Construction on Fischer Boulevard, Toms River, install new bulkheading along the western riverbank in Ocean Gate. 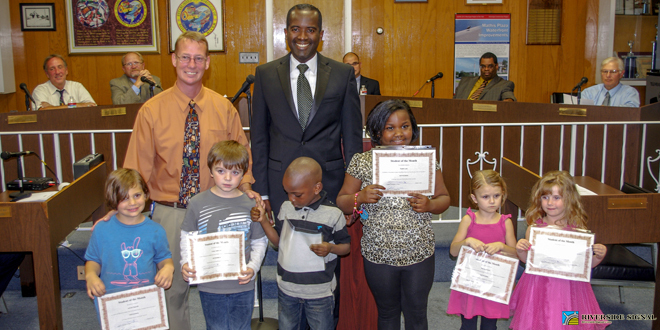 Students of the Month were honored at the South Toms River Borough Council meeting, with borough elementary school principal, Dennis Holzapfel, present to aid Mayor Joseph Champagne help pass out the awards. 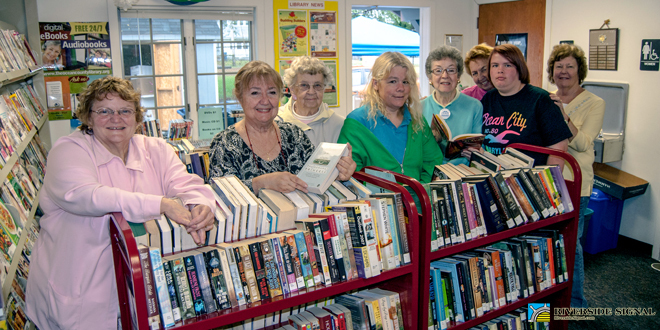 Members of the Friends of the Beachwood Library pause to take a photo during their successful book sale and basket raffle. 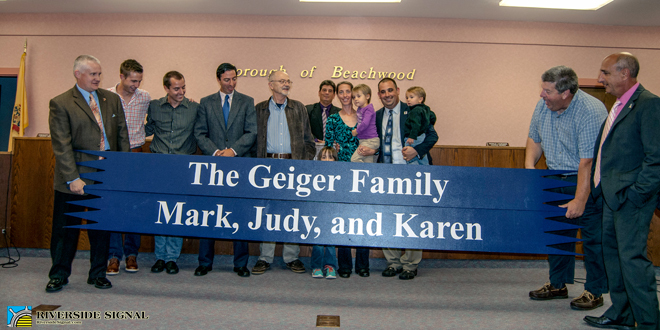 The Geiger family of Beachwood were collectively named Citizen of the Year at a ceremony that honored the work of late family matriarch Judy and continued efforts and successes of her children both within the Beachwood Soccer Club and on the international stage in the sport. 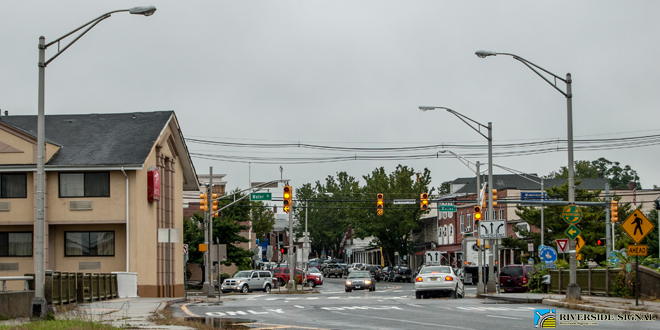 Downtown looking up from South Main Street on a rainy day in late September. 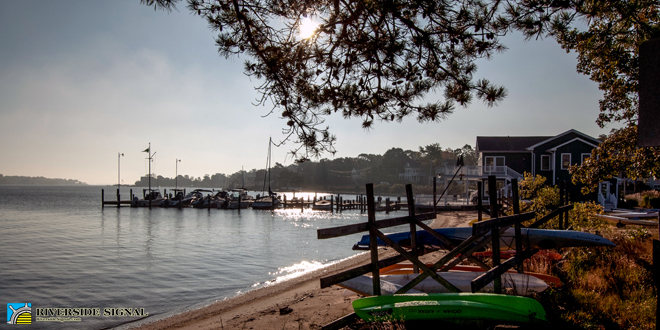 Mid-October morning sun over the Pine Beach Yacht Club, 2014. 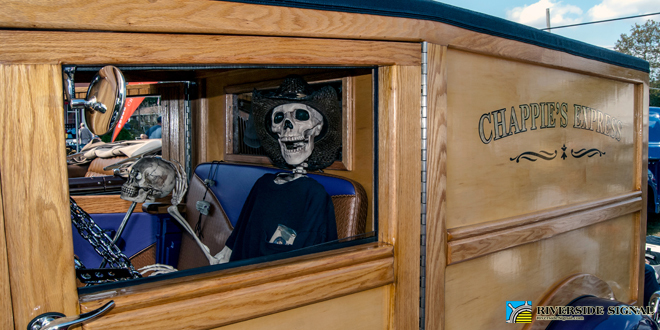 A ghoulish visitor at the Ocean Gate Volunteer First Aid Squad’s 9th Annual Car & Motorcycle Show. 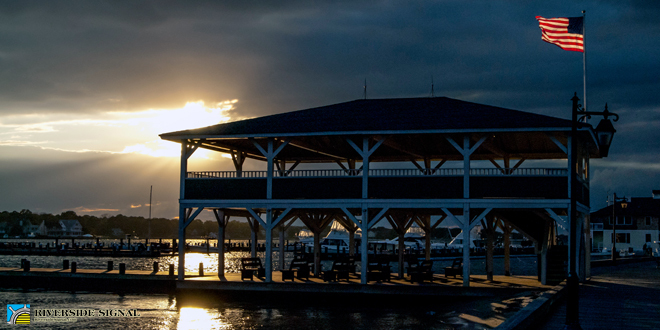 The Central Avenue Pavilion, Island Heights, at dusk on a Saturday night. 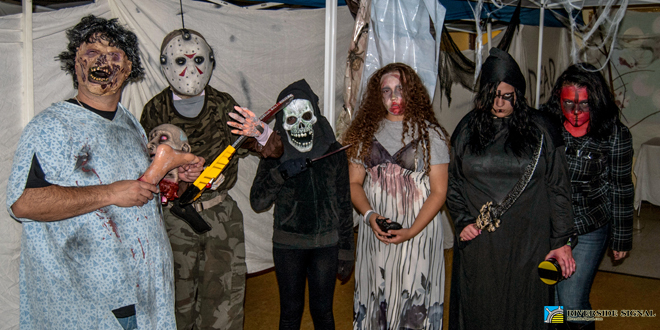 Some of the cast members involved in the South Toms River Recreation Commission’s “Maze of Terror” fundraiser. 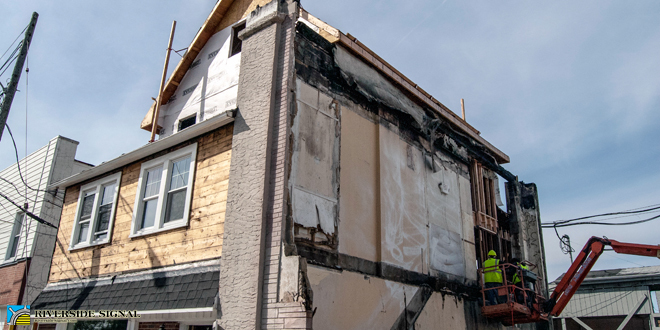 Workmen remove the last vestige of the burned and demolished 99-year-old McClenahan building from its fused side with the Forcanser building. 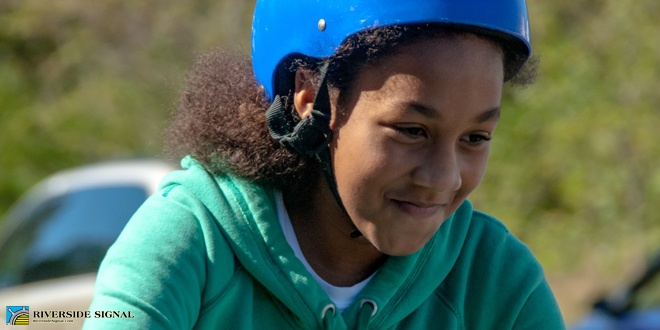 Enjoying the second annual bike rodeo at South Toms River. 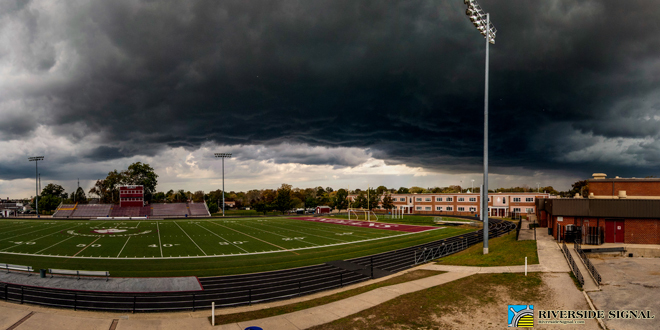 With all the wild weather we had yesterday, the Riverside Signal was out and lucky enough to get this shot of a roiling black storm cell hovering over Toms River High School South just before the skies erupted (taken from the top of the visitor’s stands at Detwiler Stadium). 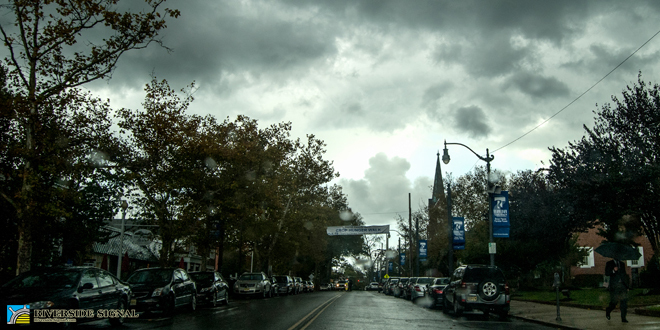 A dark and rain-whipped Washington Street downtown mid-afternoon. 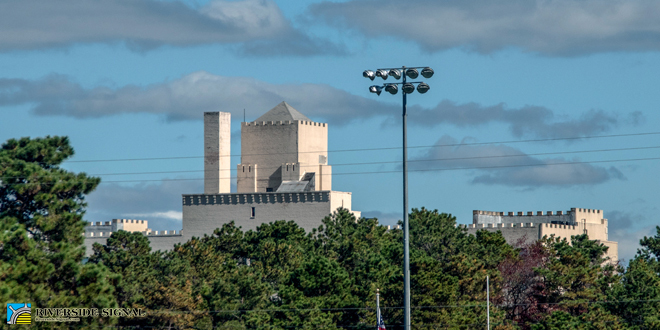 Here the former Royal Pines Hotel rises above the pitch pines as seen from the sports fields at Veterans Park, Berkeley Township. 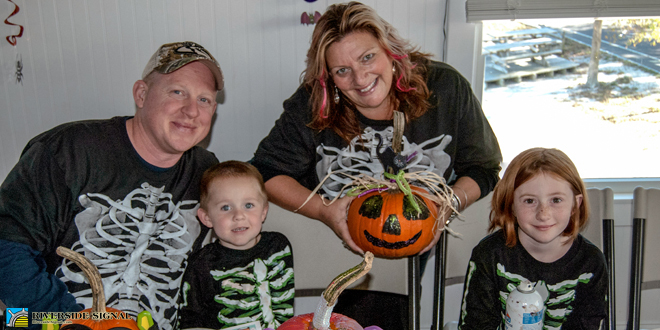 The Pine Beach Yacht Club held their annual Children’s Halloween Party, with many local families enjoying pumpkin decorating, seasonal treats and the Halloween decor. 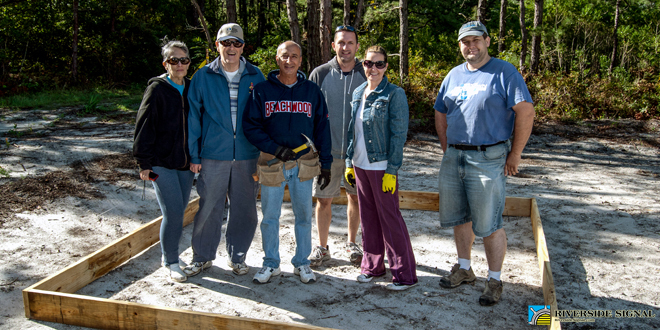 Members and volunteers with the Beachwood Environmental Shade Tree Committee pause for a photograph in a completed garden box. 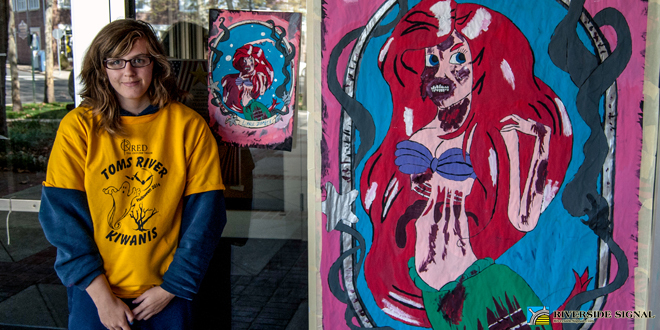 Toms River High School South art students with their downtown painting creations before the annual Halloween parade. 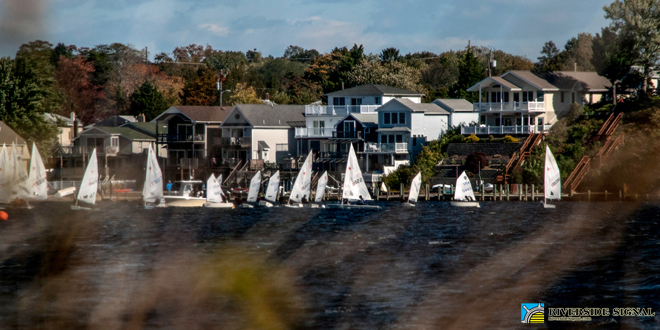 Toms River Yacht Club’s junior and senior fall series regattas, seen here sailing to the west of Money Island. 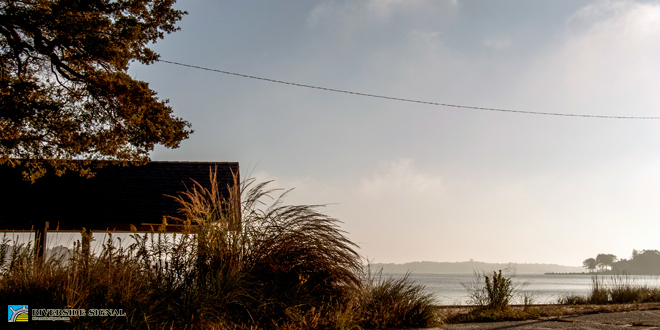 Photo taken at New Jersey Avenue, Pine Beach. 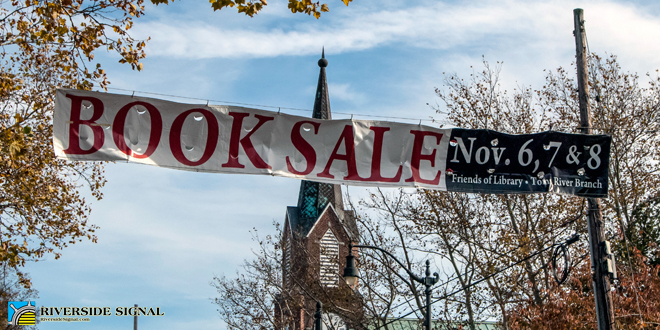 Washington at Main, Friday, October 25th, 2014. 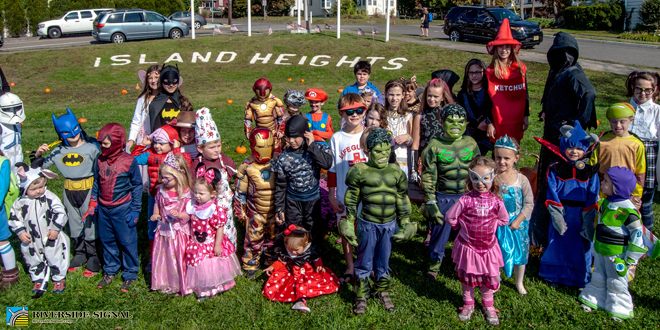 Children gathered for a group photo at Letter Park before the annual Island Heights Recreation Halloween parade. 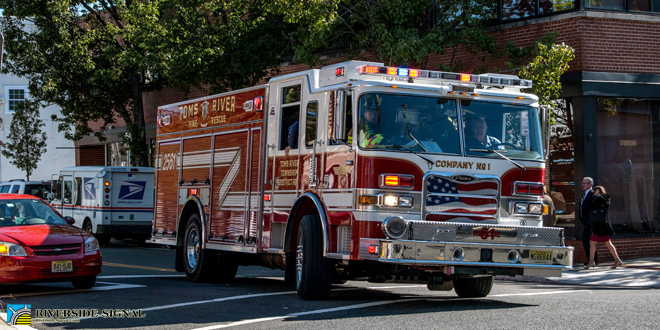 Toms River Fire Co. No. 1 tears around the corner at Washington and Main to get to the scene of an accident near Community Medical Center. 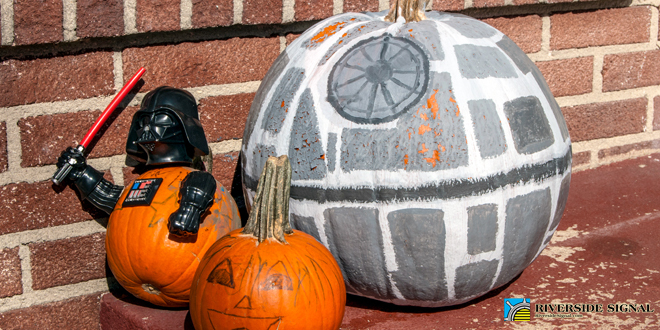 And the winner of our favorite decorated pumpkin so far is… (seen downtown). 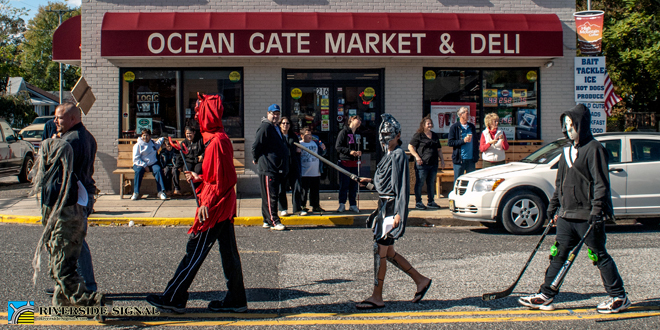 Annual Ocean Gate Children’s Halloween Parade, hosted by the Ocean Gate Vol. 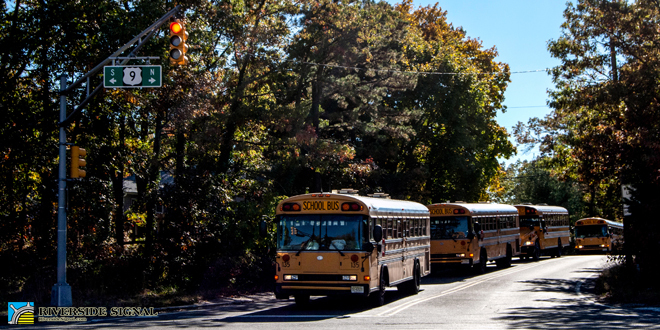 Fire Co.
A line of Toms River Schools buses wait at the Surf Avenue/Route 9 light in Beachwood between school dismissals. 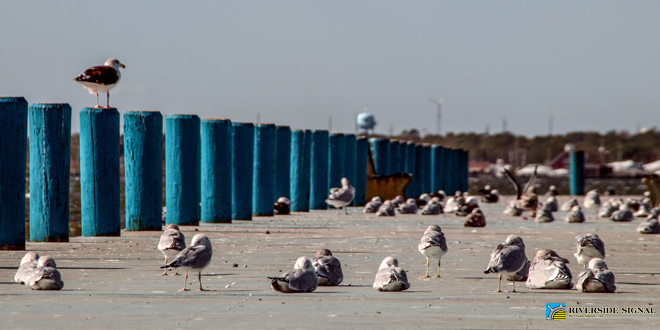 Gulls enjoying the mid-autumn season quiet on the 5th Avenue bay pier in Seaside Park. 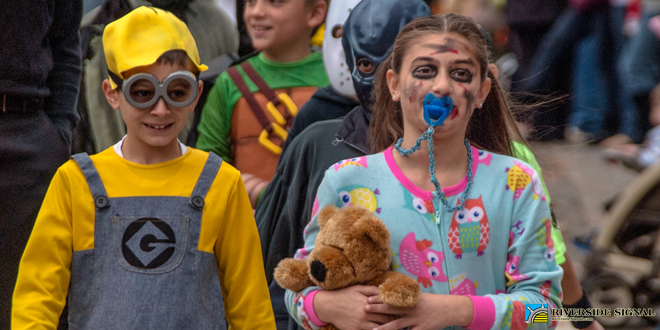 At the annual Pine Beach Elementary student Halloween parade. 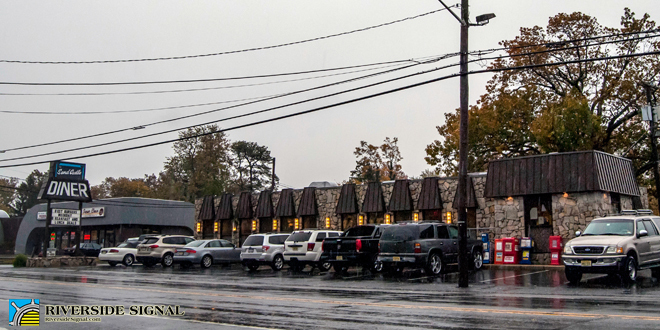 The near-full parking lot reflected many patrons who chose to head to the Sand Castle Diner and huddle up against the wind and driving rain on a new and cold November day. 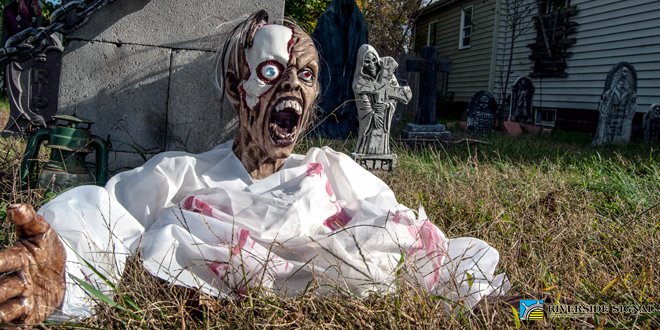 The face that only a mother (monster) could love; a snippet of the overall scene at a great Halloween-decorated house on South Main Street in South Toms River. 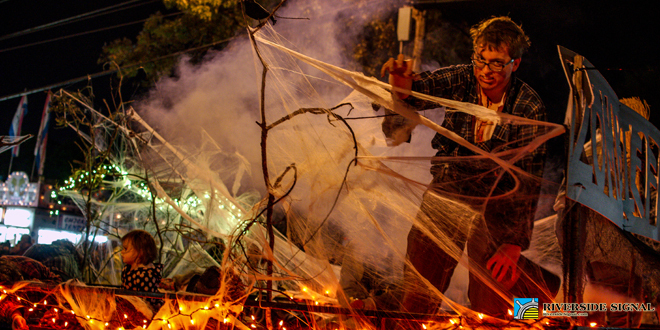 Annual Toms River Halloween Parade. 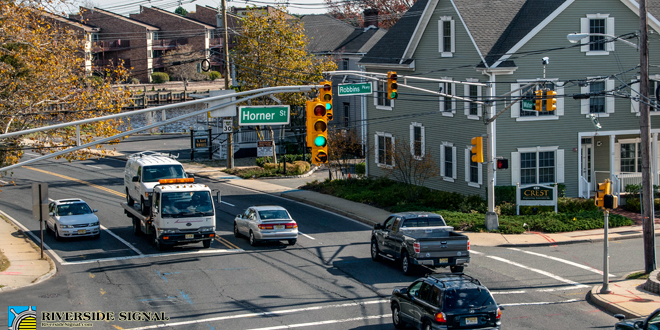 Water Street traffic at Horner Street/Robbins Parkway. 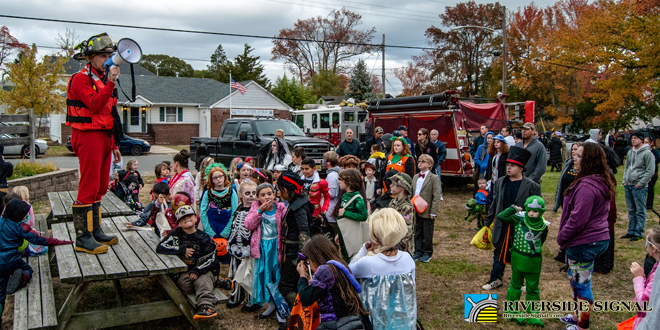 Councilman and volunteer firefighter, John Serpica, hilariously decked out in long underwear and some of his firefighting gear, directs children and parents at the Ocean Gate PTO’s 1st Annual Trunk or Treat on Halloween. 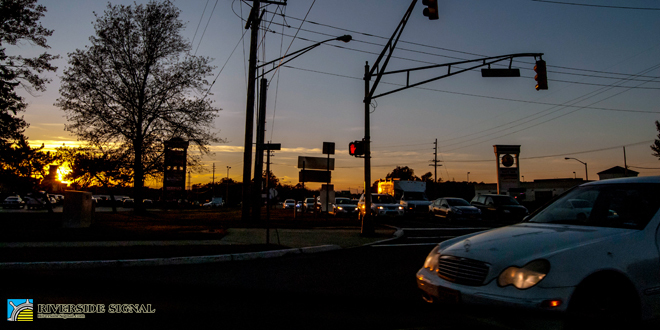 With the end of daylight savings on Sunday, dusk now comes just early enough to blind many westbound drivers heading home from work. 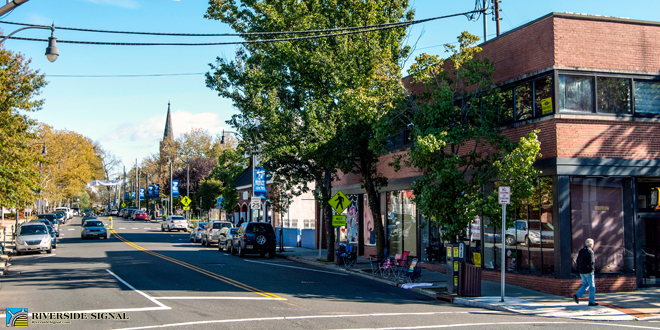 Shown here: Route 37 at Main Street. 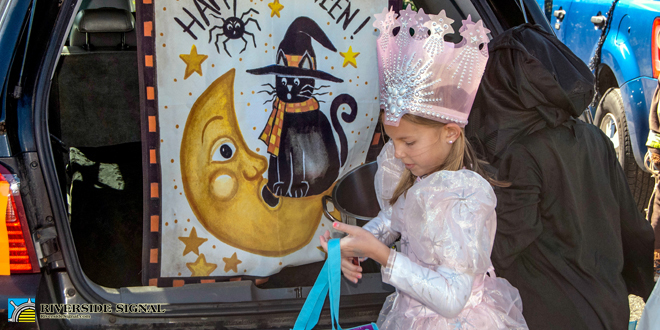 A Seaside Park youth accepts candy from the back of one of the creatively decorated trunks during the Seaside Park PTA’s annual Halloween Trunk or Treat. 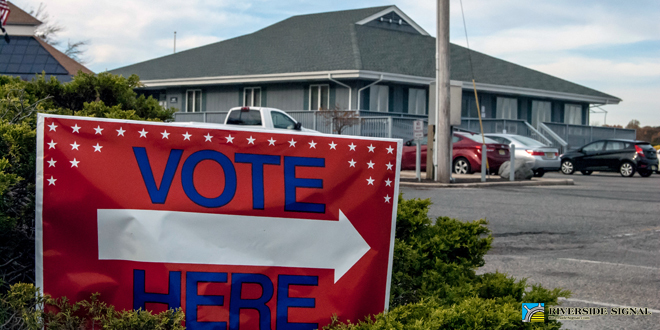 Beachwood Community Center, Compass Avenue, November 4th, 2014. 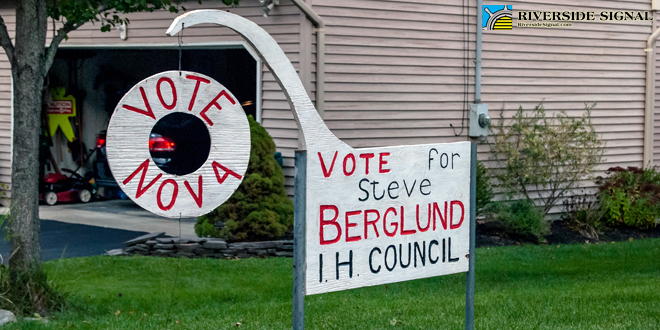 Island Heights incumbent councilman, Stephen Berglund, had the best election signs of any we’ve yet seen. 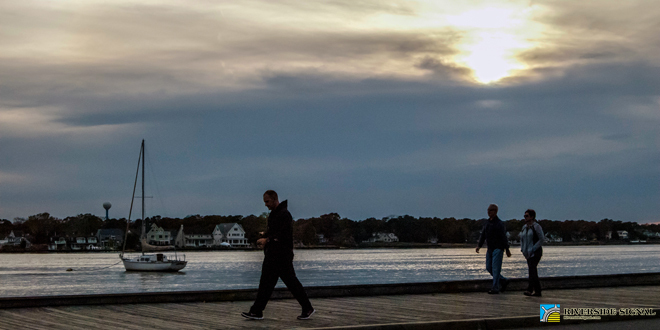 Walkers along the Island Heights riverfront at the new early dusk the end of daylight savings brings. 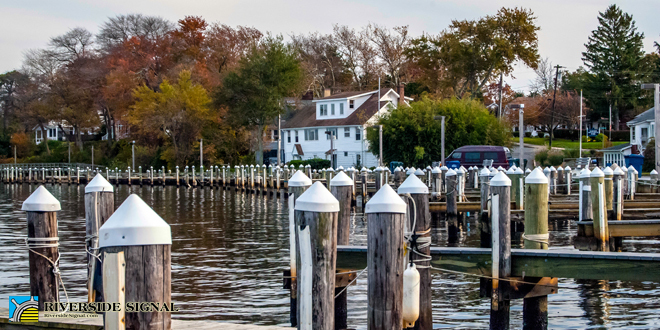 Beachwood Marina, closed and quiet now, waiting for winter. 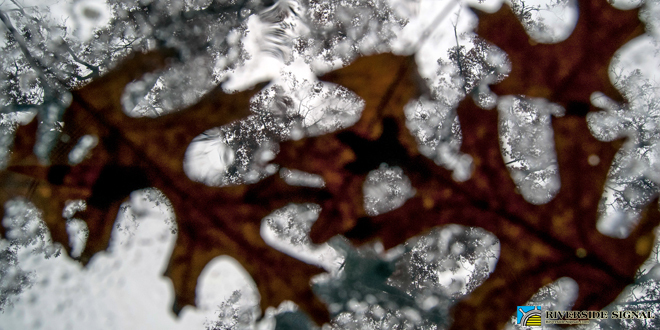 November 4th, 2014. 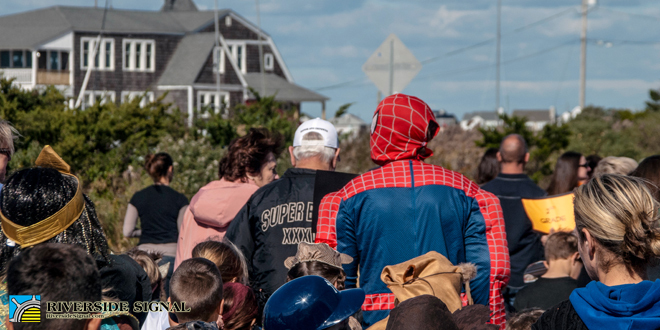 Annual Seaside Park Halloween Parade. 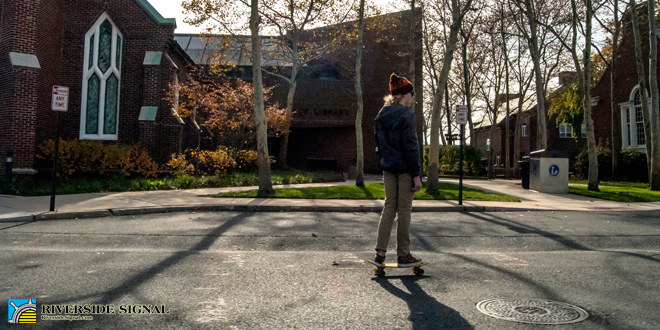 Numerous skateboarders took advantage of a day off from school and the mostly empty downtown on Election Day. 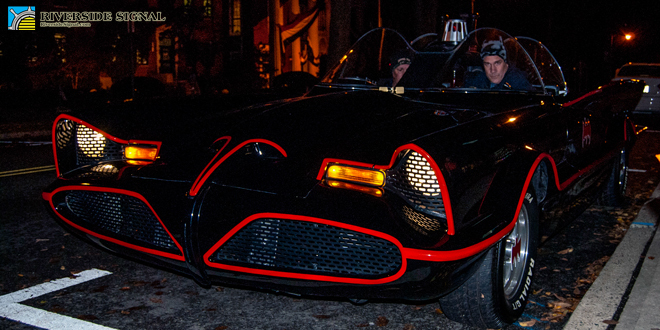 A custom-built 1960s television show Batmobile made an appearance at the Batman 75th Anniversary Celebration at the Toms River Library on Washington Street. 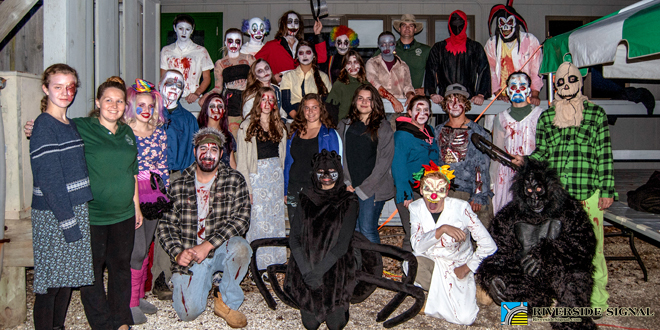 The cast of Cattus Island Park’s annual Terror Walk fundraiser gathered for a group shot before heading out to scare more patrons. 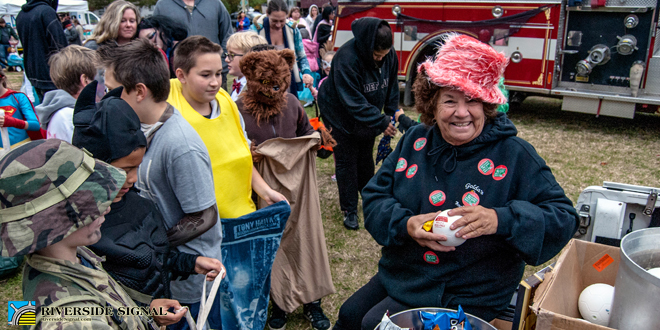 Councilwoman Joella Nicastro greets trunk-or-treaters with treats from the municipal alliance. 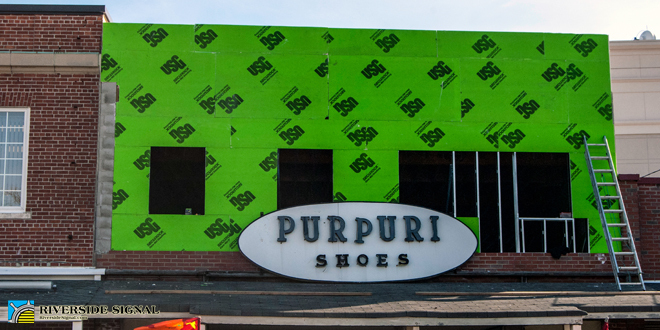 Work continues on the new second floor of Purpuri Shoes on Main Street downtown. 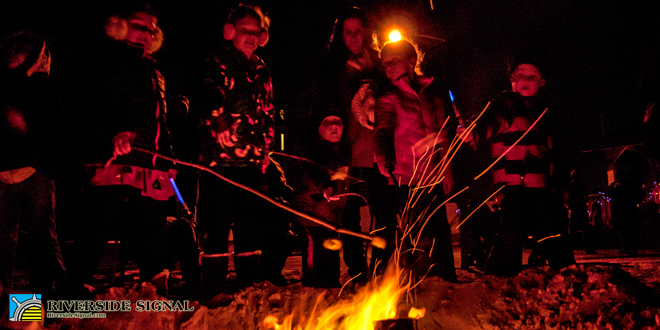 Families enjoyed the annual Island Heights Beach Bonfire, held on Summit Avenue Beach by the Island Heights Recreation Committee. Pfc. 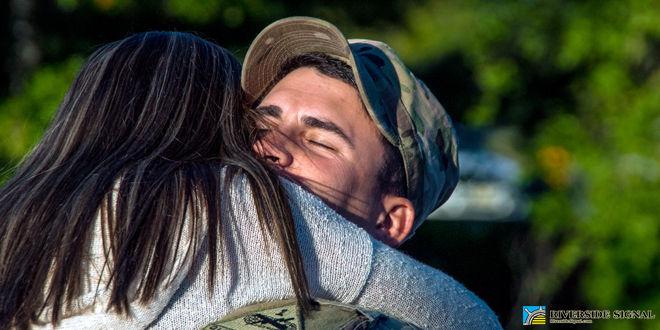 John D. Mount, welcomed home for a visit. 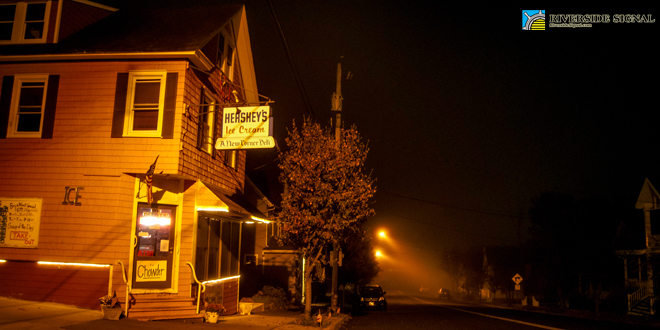 Island Heights Central Avenue and the New Corner Deli & Market in fog. 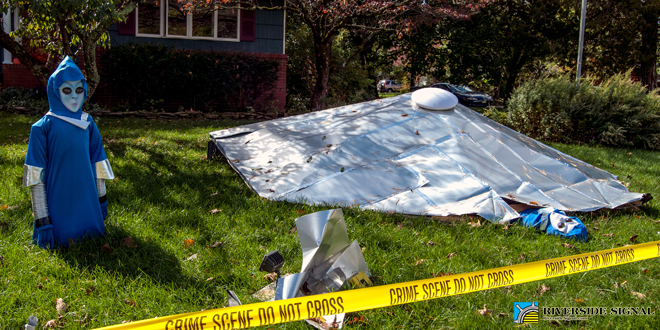 Spoiler alert: on a clear night, you can see all the way to the riverfront pavilion at the end of the street there. 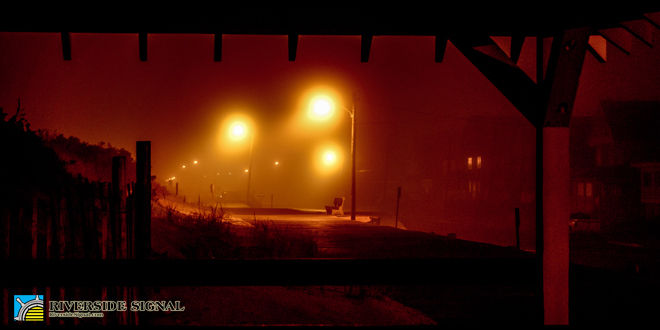 View from a beach shelter near 4th Avenue in Seaside Park in fog. 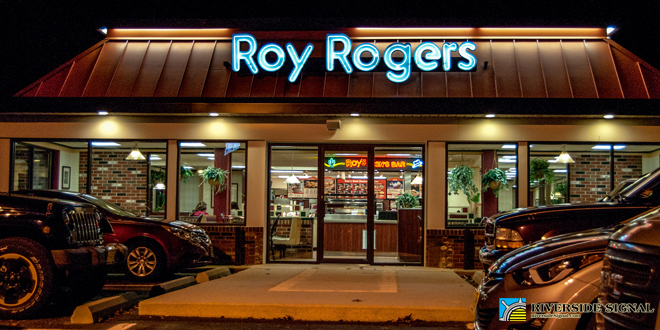 Hey – didja see that the Roy Rogers in Pine Beach got a new front entrance? 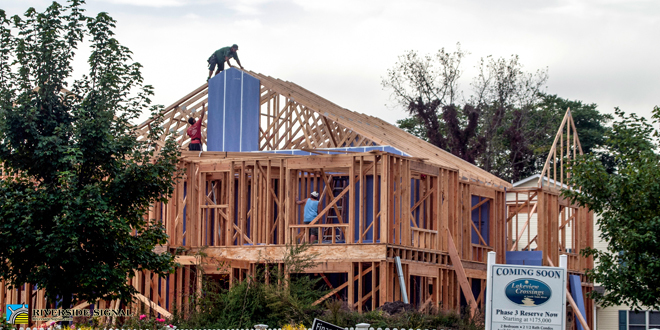 This may not be news to city slickers, but around here, it counts. 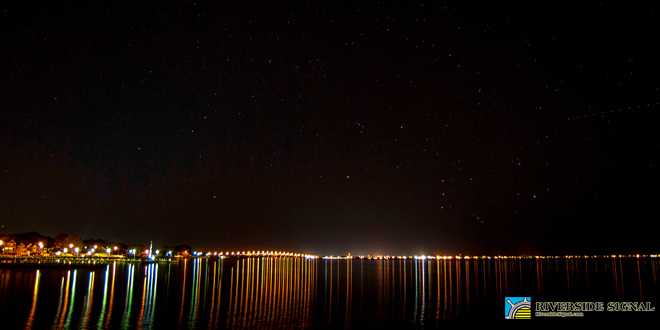 The stars above the Seaside Bridge and barrier island, as seen from the old Wanamaker campgrounds in Island Heights. 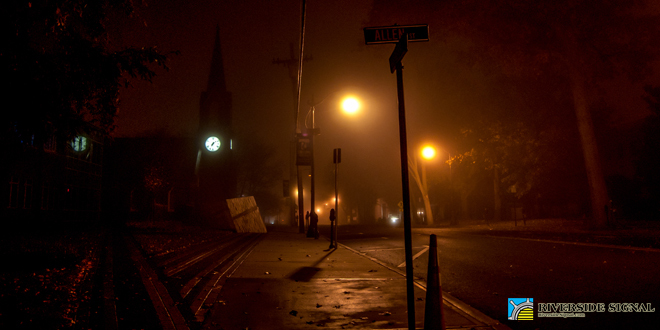 Allen at Washington streets, late night fog, Toms River, 2014. 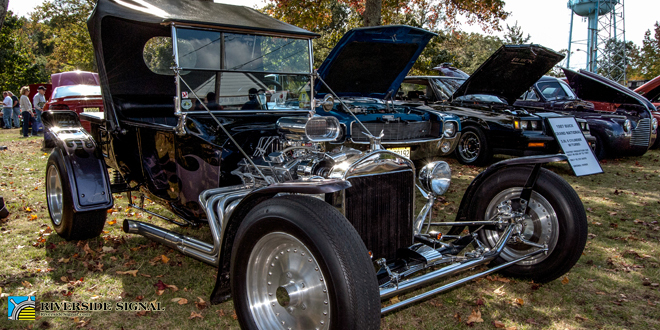 Annual Ocean Gate Car Show. 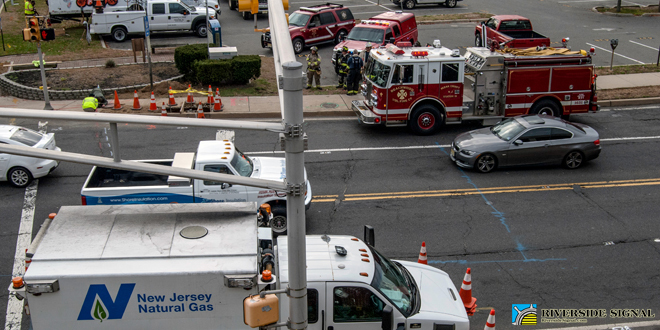 The Beachwood Volunteer Fire Company responded to a scene on Water Street for mutual aid coverage when a New Jersey Natural Gas crew working at the Horner Street corner broke a pipe. 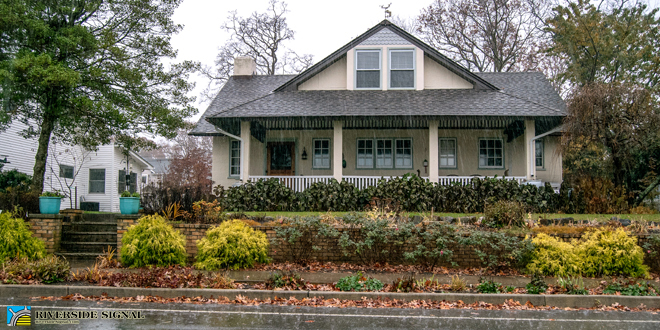 The “Ceement House” on Riverside Drive in Pine Beach (built 1909) in the rain. 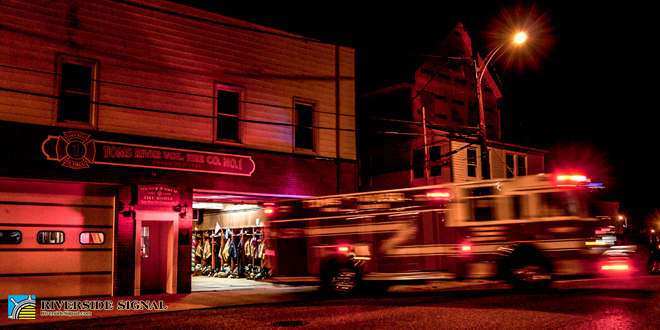 Volunteers with the Silverton Fire Company on the scene at the West Water Street fire. 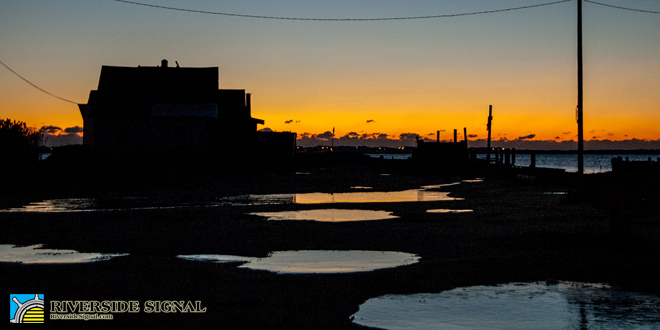 Just before dawn at Good Luck Point, November 19th, 2014. 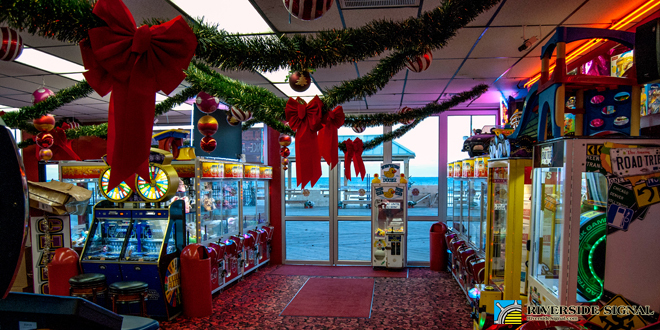 Lucky Leo’s Amusements in Seaside Heights this past week decorated for the coming Christmas holiday. On Tuesdays from 4 to 7 pm, the arcade has special Double Play Tuesdays with half priced arcade and claw games, free pizza and a grand prize giveaway. 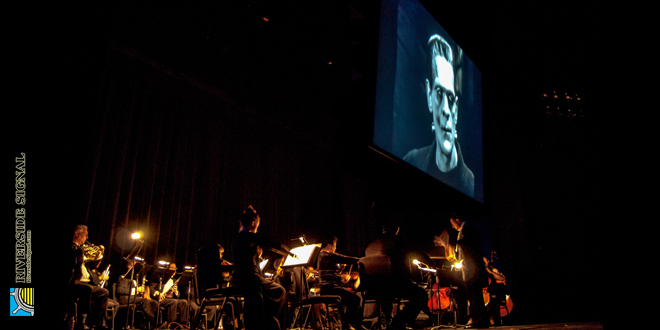 The Garden State Philharmonic celebrated the Halloween season with a special showing (with live musical accompaniment) of the cinema classic Frankenstein. 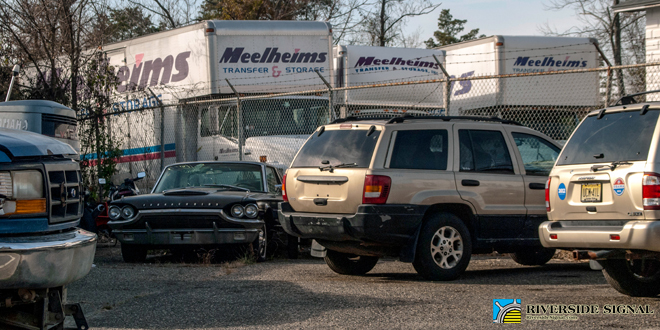 A mid-20th century Ford Thunderbird sits waiting for a new windshield at an auto repair yard on Flint Road in South Toms River. 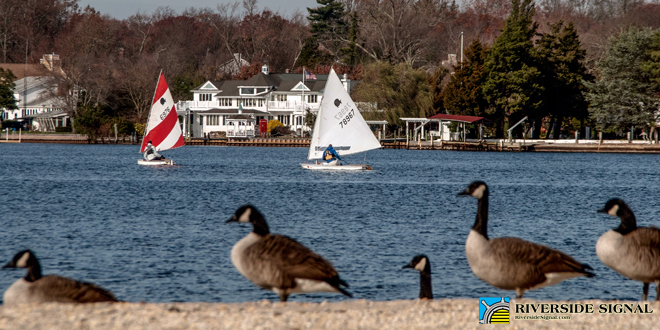 Geese lounge along the waterline on Beachwood Beach as several local sailors took advantage of the mild weather on the Toms River. 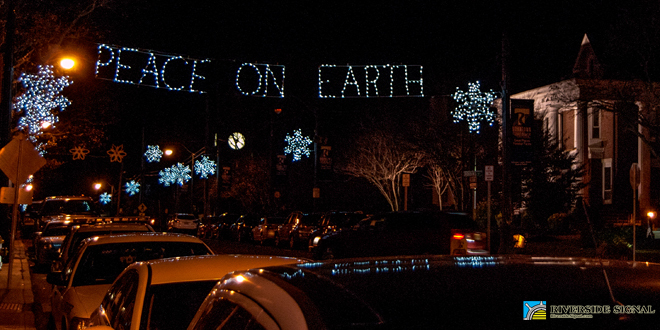 A bustling Washington Street in downtown Toms River on a Saturday night at the start of the holiday season. 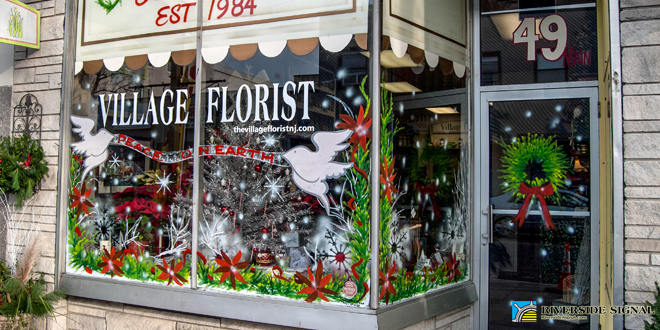 Village Florist unveiled its new holiday window theme on Main Street. 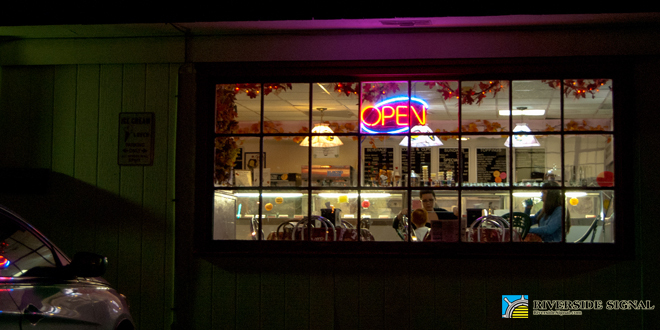 Local residents enjoy a late autumn scoop of ice cream at Two Sisters Ice Cream Stop, Beachwood. 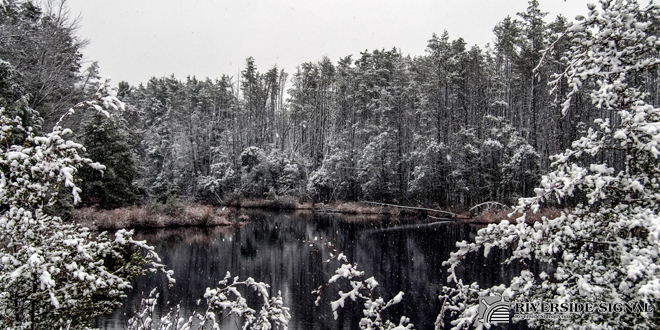 Brookforest Beach on the Jakes Branch, South Toms River, December 8th, 2014. 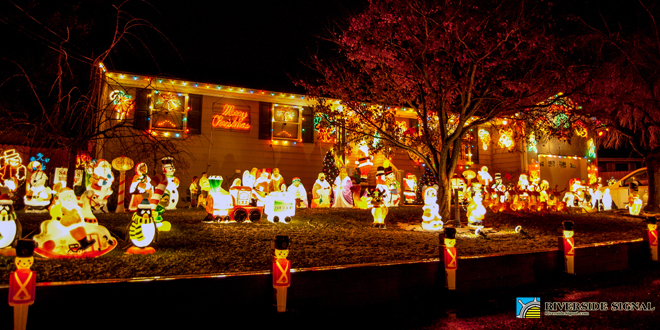 This home on Spar Avenue in Beachwood has been a holiday spectacle for years and can be seen easiest when heading east on Railroad Avenue. 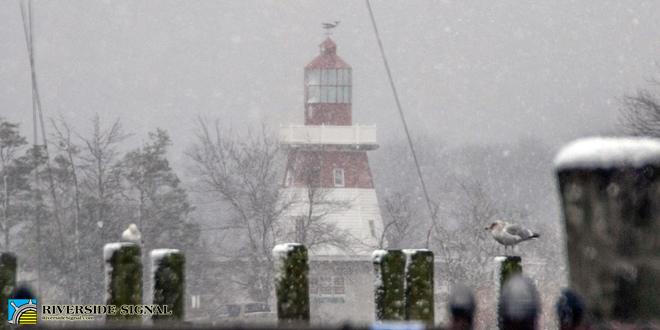 Gulls rest on the pilings at the county dock on Water Street, Toms River, as the Lighthouse Point Marina stands silent across the Toms River in the falling snow on December 8th, 2014. 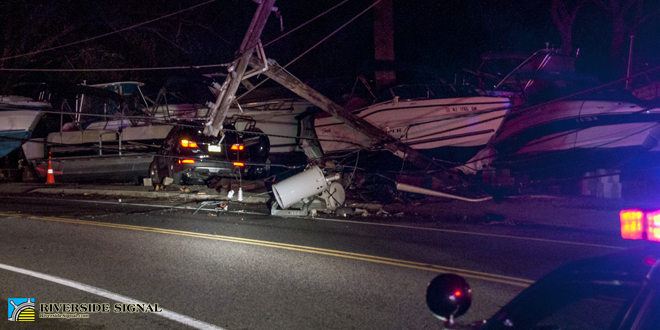 Vehicle vs. utility pole at Seaport Yacht Sales, East Water Street, Toms River on December 9th, 2014. 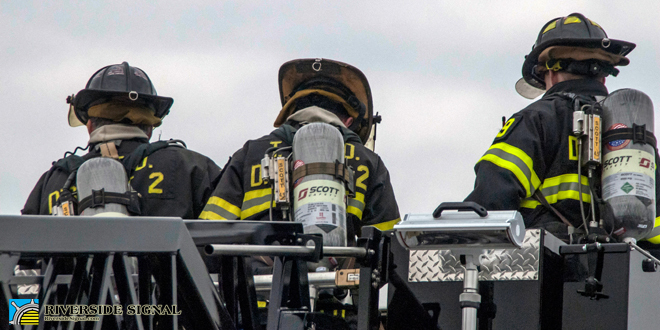 Members of Toms River Volunteer Fire Co. No. 1 race to the scene of a downed utility pole on East Water Street, the result of a drunk woman driving an SUV while intoxicated at nearly three times the state legal limit. 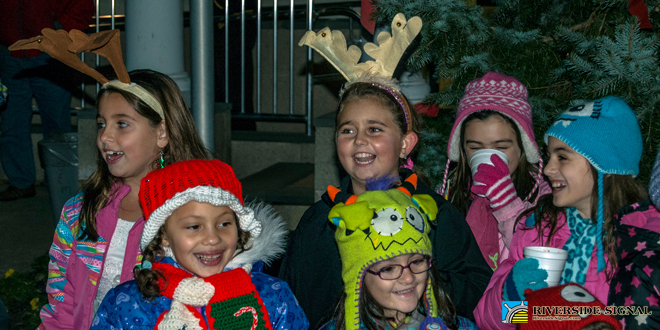 Students from Ocean Gate School sing Christmas carols at the borough tree lighting in front of borough hall on Ocean Gate Avenue. 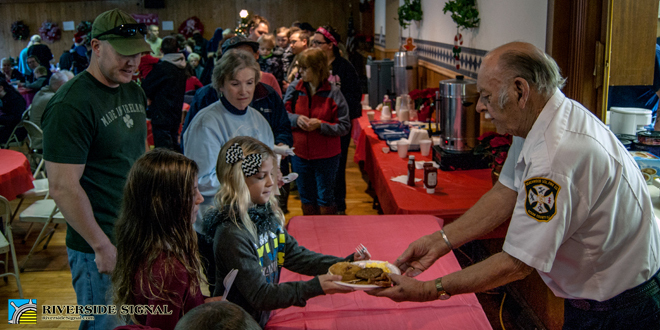 George Symington, past chief and longtime member of Beachwood Volunteer Fire Company, served breakfast for the large crowds of residents at the annual Santa breakfast at the borough firehouse. 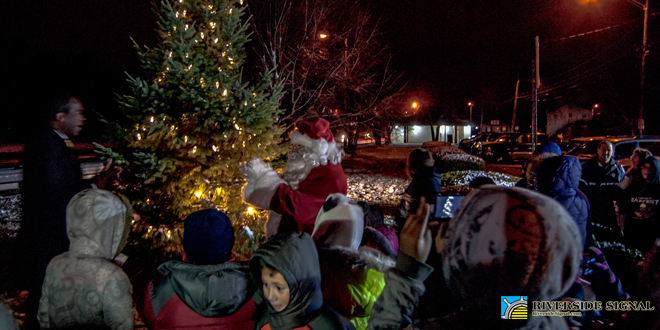 Santa Claus arrived with the Manitou Park Volunteer Fire Company Monday, December 8th, to help light the South Toms River Christmas tree and greet local children. 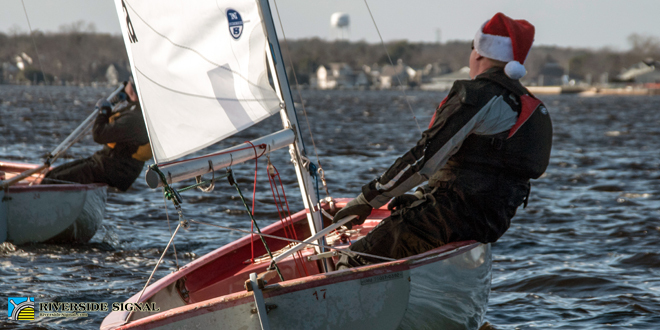 Sailors enjoy the Toms River Yacht Club’s annual Santa Bowl regatta on the Toms River on Saturday, December 13th. 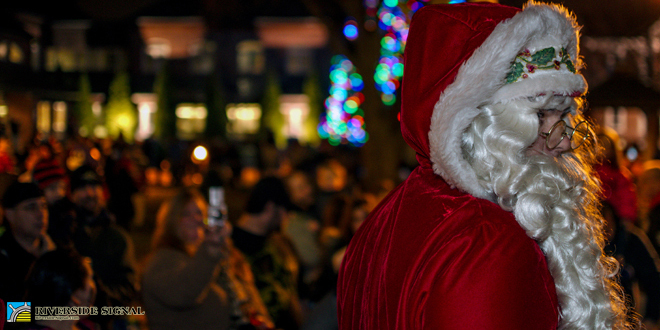 Santa came in on an Island Heights Vol. 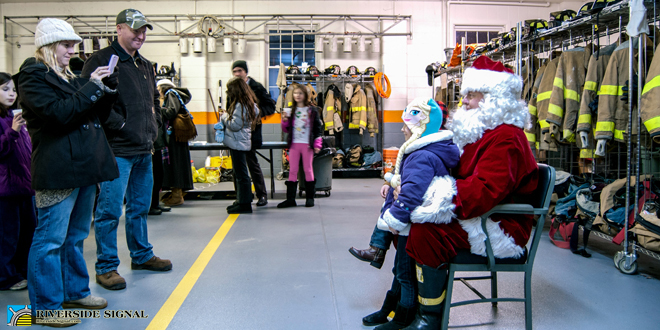 Fire Co. engine during the tree lighting and stayed to hear their Christmas wishes and take photos in the engine bays, with cookies and other refreshments provided by the recreation committee. 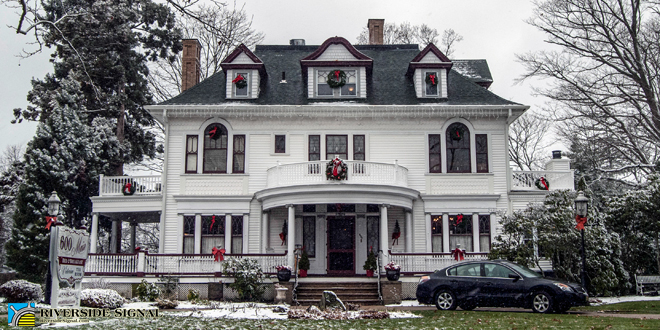 The Mathis House on Main Street in Toms River, today the 600 Main Bed and Breakfast and Victorian Tea Room, during a light ocean-effect snowfall. Beachwood Ptl. 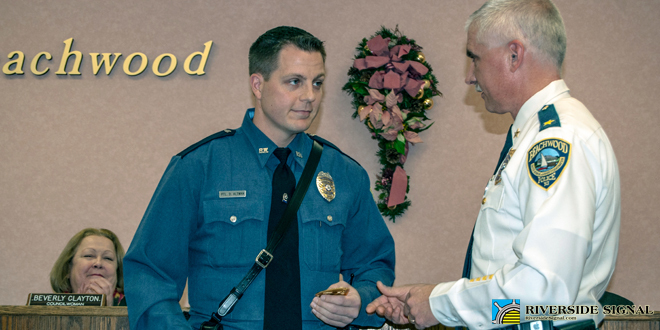 Dan Altman is promoted to the position of detective by Chief Robert L. Tapp at the council meeting. Det. Altman has been a member of the Beachwood Police Department since 2008 and is from the borough. 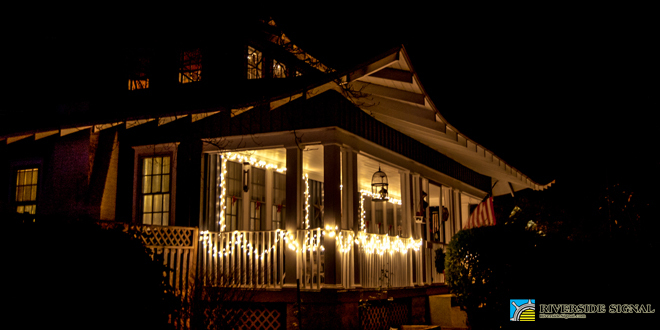 The 95-year-old Wanda Lohr Japanese Bungalow, Beachwood, aglow at night with holiday lights.